In my previous post, explained about Share and Unshare Access which will trigger GrantAccess and also RevokeAccess. But those message, as explained before will only be triggered if you Share the record to User or Team that has no previous added access at all or also Unshare the record completely removing the access from the previous User or Team. How about if you want to have your own logic when you change the Access only to the specific users that already have the access, either you remove (not completely) and also add from the existing access so long you Update or Modify it, for End users, they just know about Share, but CRM has its own message request triggered. And here is the code..
// Obtain the target entity from the input parameter. //use the logical Name to know whether this is User or Team! //what you are going to do if shared to Team? And how to register the Plugin? *Remember to always remove the “throw new InvalidPluginExecutionException” because it will stop your process. And I hope this can help you! This is the requirement in my project that currently I am doing it so basically is helping me to document it! Hi everyone, I just want to share how Share/Unshare in CRM will trigger a plugin or just in case you need to do some logic after users has done the Share/Unshare records in CRM. Especially if you want to Share the child records once you share the parent record, yes you can do the Cascading behaviour, but you might be aware that this parental and configurable cascading behaviour can only applied to 1 relationship, so imagine you have many entities, which this problem is the one i am facing right now. In the Plugin Registration Tool, there is no Share or Un-Share Messages and you see MSDN also does not have! So meaning CRM does not allow the injection of the Share or Un-Share logic? No..CRM does allow, just the Message Name is.. I just give you the concept that you can just continue from it..
Yup this is the last step, just using your favorite Plugin Registration Tool will do. *But, you need to Remember that Share here meaning performing Share to the user or Team that previously did not have any Access, it will trigger the GRANTACCESS event. And also Unshare means Completely remove the Access, then it will trigger the REVOKEACCESS event. If you want to only modify the Access (ex: from Read and Write to Read only), then you need to register your plugin to another message, so call MODIFYACCESS which i will tell you about this in the my next post..(I hope soon). And I hope this is helpful for you guys! I just try to document what just happened to remind myself and help other people if needed. So basically when try to import solution from our Development Organization to another CRM Organization, we encountered the problem as described in the system. 3. In my log, the Component type you can see in which entity and also with Component type, I found it was "Form"
So I try to minimalize the effort by creating new solution with the component only using the troubled entity, easier to do checking in the end because only one component included. Then I searched the Google and found useful information. yeah, it is definitely because of there is at least one field with same schema name but different data type. But in my case is not same. In the end I also realize that I have same schema name, same data type, but it is Option Set. So how I solve in the end? I delete the field, remove from form as well in the destination then after that I publish All Customizations and then I re-import again the Solution. My Friends, this case is really common issue and try to reduce the possibilities by downloading the log and also using smaller solution with the specific component to check. Not only if the data type is different, but if it is an Option Set, local and global Option you also need to care. Try to avoid this by always check your schema name or if not commit do not create the field first (if possible only). 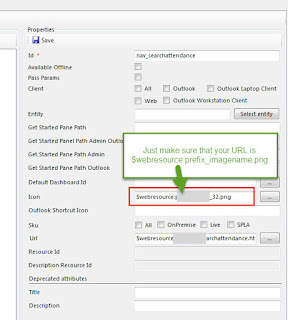 if you encounter a problem that you cannot see the icon in your customized Sitemap, do not worry, it is known issue, but there will be a workaround. 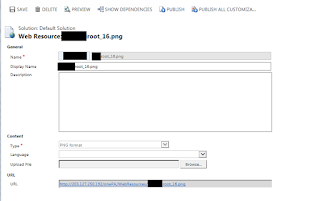 Basically, it was caused by the URL of the Image that is not correct rendered in the CRM Web, it keeps rendering the root location, not the real path. 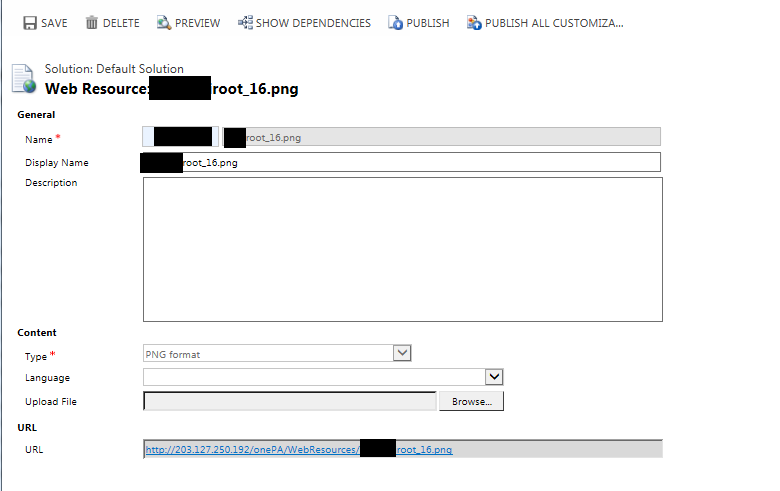 It is referring to the WebResources/imagename.png not the customized folder path, so it is pointing to the root folder, instead. 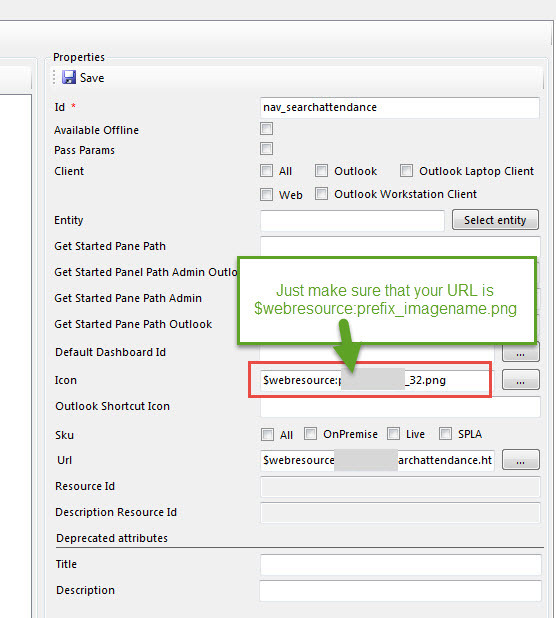 Knowing & using this Concept, so tried to have workaround by uploading new image for the icon using the expected path. And this is needing our best buddy tool, no other than XrmToolBox, thanks Tanguy to ease me doing this. Hi Just want to share the Code to Calculate the Aggregate in CRM, especially for those who are in the CRM version, older than 2015 so that there will be no calculated and roll-up field so far. and please join to our group..